A quick and easy vegan tomato soup, made with a tin of tomatoes, ginger, maple syrup and a little seasoning. Another abmitmoreveg soup recipe. This is so simple but it’s nice and chances are you have those ingredients in your cupboard right now. I didn’t even attempt to eat healthily for the last six weeks. ’twas not the season for healthy eating, but heading into the new year I am once again filled with good intentions. It’s not easy to go straight from a sugar (mostly chocolate) filled diet to healthy cleansing recipes so I thought a nice sweet tomato soup would be a gentle way of easing back into things. I’ve mentioned before the health benefits of tomatoes; tomatoes are full of lypocene, which is reputed to be very good for you, and it is more easily absorbed when the tomatoes are cooked. You can find some more information on the health benefits of tomatoes here. 1 tin of whole plum tomatoes, 1 tin (same tin) of water, 1 small-medium sized onion, fresh ginger root, maple syrup and sea salt. Stir the grated ginger into the maple syrup. Heat a little sunflower oil in a saucepan. Stir in the onion, cover and leave to cook on a gentle heat for 5 minutes or until tender (but not brown). Add in the tomatoes and break them up with a masher. Turn up heat to high. Fill up the empty tomato tin with water and add this to the pot. Bring to the boil. Stir in the maple syrupt and ginger into the soup. Then cover and reduce heat to gentle/moderate. Leave to simmer for about 20 minutes, or until the soup has taken on a velvety sort of texture. Taste and add a little more salt if necessary. Blend the soup to as smooth a consistency as you like it. 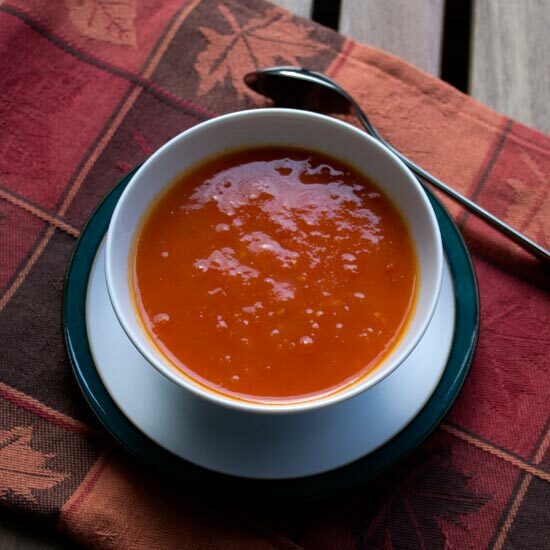 Simple and sweet, sweet tomato soup.